Meine Achte ist ein Mysterium! Bruckner's Eighth Symphony, the last he completed, embodies the composer's work, with all of its complexities and contradictions, in its late flowering. This symphony, at once extensive and distilled, has attracted the passionate attention of listeners, musicians, scholars, and critics, yet it remains fascinatingly inscrutable. Bruckner was correct: the Eighth Symphony has proven a mystery. Of all of his symphonies, it poses the most elaborate questions. Musically it stands in complex relationship with the symphonic genre. The grandeur, expressive intensity, and scope of the work directly confront the problem of the symphony after Beethoven and after Wagner, and with its vaguely articulated program it inhabits the crucial space “between absolute and program music.” In performance, the symphony has always challenged both interpreters and listeners, and has engendered both exuberant praise and vociferous criticism. Nowadays to address the Eighth Symphony, or indeed any facet of Bruckner's work, critically means inevitably attending to modern traditions of reception. Our perceptions of Bruckner are mediated by the conceptual residue of preceding generations of interpreters; this is true of any artist, but with Bruckner the situation is particularly acute. Images of Bruckner as a simple genius, an unwitting mystic, a Parsifallike naïf have long shaped attitudes toward him and his music. His music is also shadowed by a long tradition of negative criticism. In the nineteenth century, one important body of opinion decried Bruckner's compositional approach as illogical, incapable of supporting large-scale structures, and thus fundamentally unsuited to the genre of the symphony. The first published edition of the Eighth Symphony has long been out of print, and its contents and history are veiled in some mystery. This much is clear: the symphony was first published in March 1892 by the firm of Haslinger-Schlesinger-Lienau (Berlin and Vienna) and although the published text is based on the 1890 version, it differs in some ways from the text preserved in Bruckner's final manuscript (which is reproduced by Nowak's critical edition of the 1890 version). These differences include a cut of six bars in the Finale (following m. 92), the repetition of two bars later in that movement (mm. 519–20 of Nowak's edition are repeated), some changes in the orchestration, and the addition of many tempo, dynamic, expression, and agogic markings (see Appendix B). The 1892 edition also contains two suggested cuts, marked “vi-de” above the staves, which if taken would result in the excision of mm. 262–78 of the first movement and mm. 519–76 (which correspond to mm. 523–580 of the 1890 version) of the Finale. The 1892 edition is now almost universally rejected as “inauthentic” and its textual differences, like those found in all of the first printed editions of Bruckner's works, are generally assumed to be the result of illegitimate editorial changes made without Bruckner's consent and possibly even without his awareness. The 1887 version of the Eighth Symphony has had a rather odd career. In the aftermath of Hermann Levi's negative appraisal in the fall of 1887, Bruckner set it aside, and it was soon eclipsed by the revised version of 1890. It was not until the appearance of Nowak's modern edition in 1972 that the score became available for study, performance and, inevitably, comparison against the canonical 1890 version. For several decades before this, however, the 1887 version, then known only by reputation, and the events surrounding its revision led a shadow existence. During the “Bruckner-Streit” of the mid-1930s – the debate in Germany and Austria about the authenticity of the previously available editions of Bruckner's works sparked by the appearance and promulgation of the initial volumes of Robert Haas's collected edition – Levi's reaction to the first version of the symphony occasioned far-reaching interpretation and speculation, some of it extravagant. For example, Haas asserted, without offering substantiation, that it depressed Bruckner to the point that he entertained “suicidal notions [Selbstmordgrillen].” A number of writers and scholars, including Haas, came to believe that the incident and its psychological after-effects were decisive in sending Bruckner into what they saw as a spiral of uncertainty and self-doubt, during which he undertook, at least partly at external behest, a series of ill-advised revisions of not only the Eighth Symphony, but also the First, Third, and Fourth Symphonies (all of which were revised between 1887 and 1890). Allusions to sublimity often color descriptions of Bruckner's music. Program notes and serious criticism alike have long effused about the transcendent, metaphysical depth of the symphonies, and the Adagio of the Eighth Symphony has been identified as “sublime” with particular frequency. Josef Schalk's program identified the Adagio as a “sphere of calm, solemn sublimity,” and ever since, the term “sublime” has been prone to attach itself to this movement. A popular guide to Bruckner's symphonies published in 1907 called this Adagio “one of the most solemnly transfigurative, splendid, and sublime tone-pieces ever written.” Bruckner's first American biographer, Gabriel Engel, referred to it as “the sublime slow movement … [that] rises to unprecedented heights of devotional ecstasy.” As recently as 1997 Edward Rothstein placed the Eighth on a short list of works that successfully aspire to sublimity. In the final decades of the nineteenth century the symphony was a loaded genre, both culturally and compositionally. Beethoven's great examples, especially the Eroica, the Fifth, and the Ninth, had long since secured the symphony as the highest, most elevated, and most meaningful genre of instrumental music. Yet, despite its cultural prestige, symphonic composition was beset by special challenges in the late nineteenth century. A sine qua non of the symphony during this era was monumentality, a trait that was essential to the public significance of the genre in an age given to bourgeois expansiveness and increasing rationalization, in which the construction of historical memory (which is what monuments do) increasingly substituted for religion and myth. During this period many progressive composers, including Bruckner, also desired to enrich the symphony with an infusion of “Wagnerian” vocabulary. Gustav Mahler put it simply: “Wagner took over the expressive means of symphonic music, just as now the symphonist will lay claim in his turn to the expressive riches gained for music through Wagner's efforts.” This desire to win some of Wagner's “expressive riches” for the symphony raised something of a compositional puzzle. Monumentality presupposes grandeur, solidity, massiveness; therefore, a crucial task of the symphonist was to find ways of articulating large, coherent formal spans, which rested upon strong tonal and metrical frameworks, out of harmonic and motivic substance that was weighted toward expressive detail and pointed characterization and thus prone to fragmentation. The arduousness of Bruckner's process of composition and, especially, his habits of revision are legendary; yet even by these standards, the Eighth Symphony had a long and difficult genesis and evolution. It was revised by the composer and exists in two distinct versions (1887 and 1890); the circumstances surrounding its revision were unusually complex; and its path to performance and publication was tortuous. This chapter chronicles the long journey of this symphony from its initial composition in 1884–7, through its rejection by Hermann Levi in October 1887, its recomposition by Bruckner in 1889 and 1890, and its performance and publication in 1892. The Eighth Symphony originated between the summer of 1884 and August 1887, a time when Bruckner's career was reaching high tide. He had recently completed two of his most successful and powerful works, the Seventh Symphony and the Te Deum, both of which were published in 1885. While Bruckner was at work on the Eighth, the Seventh enjoyed a pair of triumphant initial performances in Leipzig on 30 December 1884 and in Munich on 10 March 1885 and several subsequent performances in Cologne, Chicago, Hamburg, New York, Amsterdam, Graz, Berlin, London, Dresden, and Budapest, as well as Vienna. The Te Deum, the Third Symphony (at that time the only other of Bruckner's symphonies available in print), and the String Quintet were also performed several times during these years. In late nineteenth-century Vienna the symphony was fraught with cultural significance; it was widely seen as the musical genre, if not the art form, that most directly could, as Paul Bekker later put it, build a “community of feeling,” a process of acute significance in the Habsburg Empire at a time when the old imperial system was increasingly strained by ethnic, nationalist, and democratic impulses. As a result, music became the focus of great cultural and political energy, and aesthetic judgments often encoded cultural politics; in particular, Wagner and the “Music of the Future” excited nationalist, Socialist, racist, and aestheticist sentiments and fueled the energies of segments of society, especially youth, alienated by the liberalism and rationalism of the established social order. Bruckner's symphonies, with their epic grandeur, monumentality, expressive fervor, and harmonic complexity, were widely linked to this Wagnerian ethos and cast as radical counterweights to the concert works of Brahms, who hewed more closely to traditional stylistic canons and, not coincidentally, was solidly entrenched as the composer of the Viennese bourgeois establishment. The critical reception of Bruckner's symphonies makes it quite clear that, intentionally or not, they antagonized segments of the haute bourgeoisie. It was in this context that the Eighth Symphony received its premiere. The symphony was the sole work in the Vienna Philharmonic subscription concert conducted by Hans Richter on 18 December 1892. Bruckner's music had only rarely appeared on the program of a Philharmonic subscription concert. Anton Bruckner's Eighth Symphony (1890), one of the last of the great Romantic symphonies, is a grandly complex masterpiece. Its critical reception has been fascinatingly contentious. Its music, at once extensive and distilled, directly confronts the problem of the symphony after Beethoven and after Wagner. This book explores this many-faceted work from several angles. It documents the complicated and often misunderstood history of the symphony's composition and revision and offers an accessible guide to its musical design. It demonstrates, by means of a study of well-known recordings, how performance styles have evolved in this century. It also revisits the conventional wisdom about the various versions and editions of the symphony and comes to some provocative new conclusions. 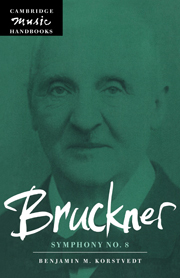 Scholarly writing about Bruckner typically follows certain well-worn paths; in particular, it tends to grant great emphasis to the notorious editorial problems that attend this composer's works. This book does undoubtedly devote more attention to text-critical concerns than do most others in the Handbook series, partly because the textual history of the Eighth Symphony is complex and important, and partly because modern understanding of it is, as I hope to show, somewhat mistaken. Editorial issues can, if approached with a critical spirit, open out into regions of broader significance, such as hermeneutics, reception history, and performance practice; yet I believe that the “Bruckner Problem” is ordinarily framed too simplistically, and that a reductive concern with textual authenticity has come to loom too large in the imagination of most Brucknerians. For these reasons some parts of this book, notably Chapters 3 and 4, are deliberately unburdened by text-critical concerns. Books that are apt for teaching advanced courses on late nineteenth-century music are not thick on the ground. I have borne this in mind while writing this volume, and will be gratified if it finds use in the class-room. I have tried to provide enough variety amongst the chapters to offer some small methodological range (from critical analysis and reception history, to textual history, with even a hint of the history of ideas in the chapter on the sublime) for an enterprising teacher to build upon. I owe great thanks to my wife Paula for her staunch support and help, and for her patience in hearing great gusts of and about the Eighth Symphony. Compared to the 1890 version, Haas's score contains sporadic minor changes in the orchestration, which are derived from the 1887 version, in the first movement, the Finale, and more extensive ones in the Adagio.